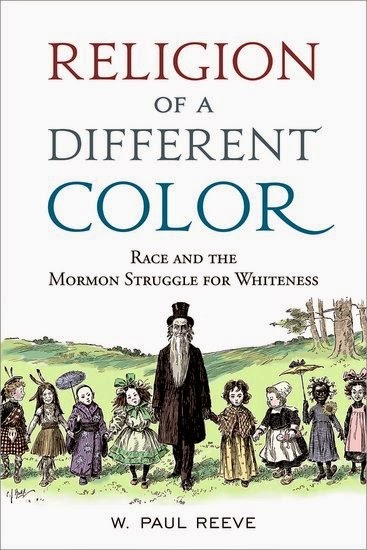 The Page 99 Test: W. Paul Reeve's "Religion of a Different Color"
Page 99 of Religion of a Different Color offers readers a glimpse into the ways in which Mormons were racialized in the nineteenth century as less than white. In this case, the accusation explored on page 99 is that Mormons dressed as Indians to kill people in what came to be called the Mountain Meadows Massacre. Mormons did, in fact, murder 120 innocent overland migrants in 1857. That much is not in dispute. Whether or not Mormons disguised themselves as Indians to commit this bloody deed is contested. Religion of a Different Color situates the accusations of Mormons dressing as Indians within a broader historical framework. Very early in their history Mormons were suspected of conspiring with Indians, of marrying Indians (something they did do), and sometimes of becoming Indians. In some cases, outsiders claimed that Mormons descended below the level of Indians to become more savage than the savages. If fact, the accusation that Mormons dressed as Indians to kill people on the overland trail predated the massacre by at least seven years. It was one of the many ways in which Mormons were racialized as less than white in the nineteenth century, especially as they were conflated with a variety of other marginalized groups: Indians, immigrants, blacks, and Chinese. Mormons responded to the various accusations leveled against them out of a desire to claim whiteness for themselves. The book follows that trajectory as Mormons went from being considered not white enough in the 19th century to too white by the 21st century. They had become so white by 2012 that one political pundit called Mitt Romney the “whitest white man to run for president in recent memory.” Religion of a Different Color considers this stunning historical evolution from the perspective that race is both something ascribed from the outside and something aspired to from within. Learn more about Religion of a Different Color at the Oxford University Press website.